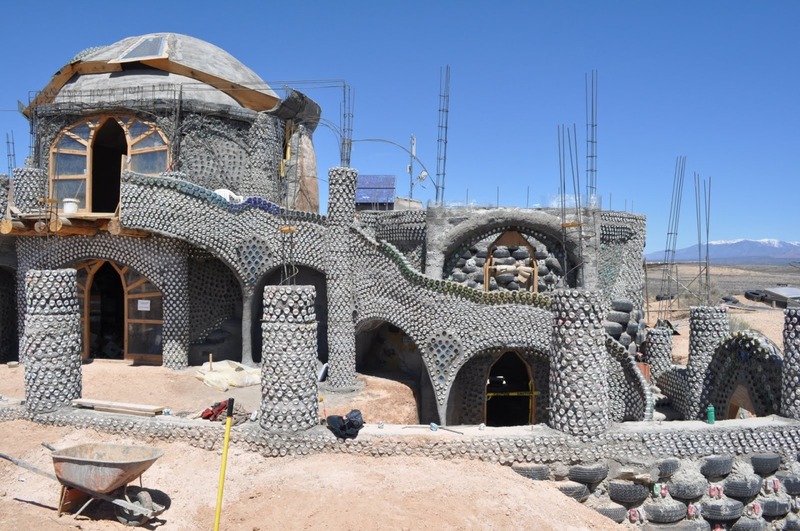 Considering how often I run into people who have never heard of an Earthship, I thought I would make a separate space here on my blog to address that question. If you haven’t visited my About page, you might start there for a general description, or you could head over to wikipedia and read their article on it. 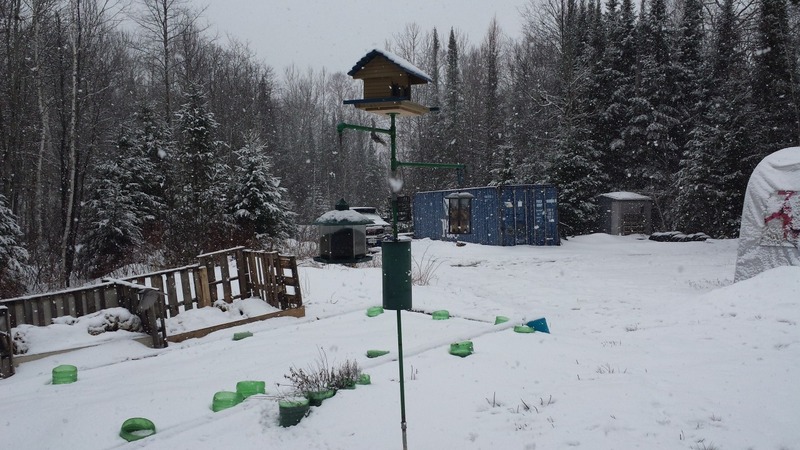 The purpose of this section is to address the six main building principles in more depth so if you want to know more how an Earthship is implemented you can get some idea. The six principles are listed on those other pages I linked, but just in case you don’t want to go check them out, I will list them again here. As I fill in the section for each principle, I will update that list with links on each article. If you have any questions regarding any of it, please feel free to leave a comment. 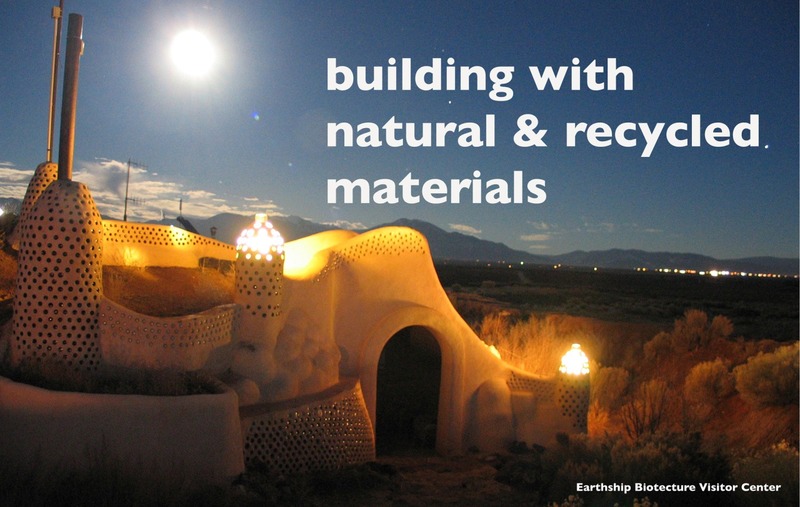 Building with natural and recycled materials is the first principle when constructing an Earthship. Using recycled materials is often expressed by using what is lying around that has usually been tossed away into a landfill. 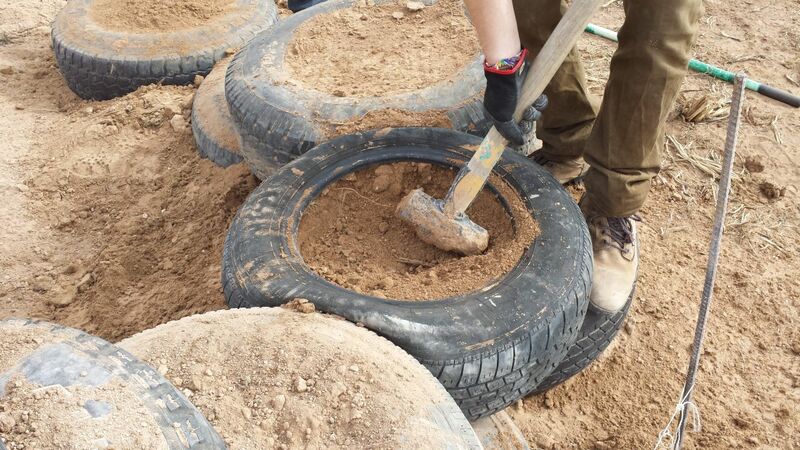 Automobile tires are probably the signature item that everyone thinks of when Earthships are mentioned. Why would you want to use tires? How about these two pictures for some motivation. 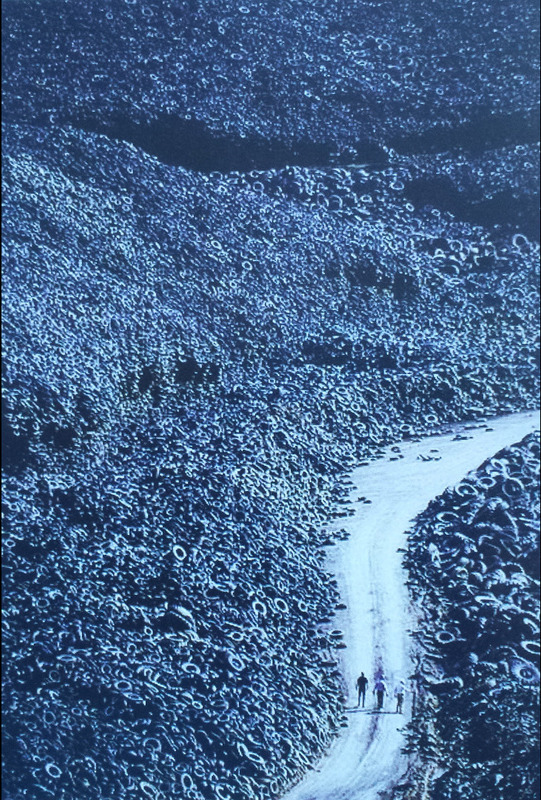 Humans have made so many tires now and after they wear out they end up in huge tire dumps because we don’t know what to do with them. That is starting to change as we are slowly finding ways to reuse tires, but building houses with them is just another item to add to that list. 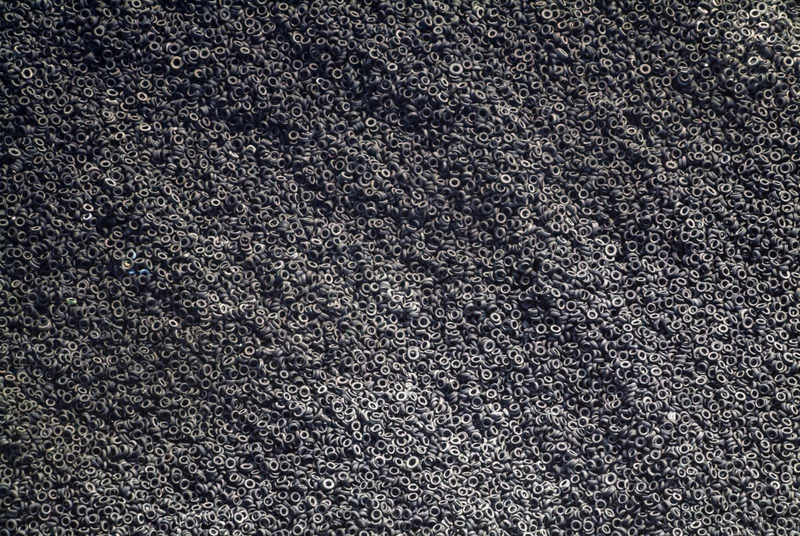 We have a LOT of tires lying around, billions of them. In fact there are now so many junk tires lying around this planet that you could almost call them a natural resource that we can use. It’s a funny way to think about it, but it might just stop you in your tracks to consider that we may have more junk tires on planet Earth than trees right now. That’s a disturbing thought. Another natural resource used is dirt. Plain dirt, not pure sand or clay, but your run of the mill pile of dirt that is a mixture if things. You don’t want organic matter in your dirt, but other that that, most dirt will work. And what do you do with that dirt, you may be asking? You pound it into the tires with a sledge hammer. I’m not going to go into the process of how that works here, but if you want more details you can check out my other post on pounding tires. Another really popular material used in building Earthships is beverage cans. When Michael Reynolds was first experimenting back in the 1970’s with alternative building materials, he started with cans. This is long before Earthships had been conceived and also long before there was any such thing as recycling. Placing cans in concrete to build a wall means you need much less concrete to form the wall. These days we do have recycling programs and beverage cans are recycled all the time. This may lead one to ask, why bother using cans when you can put them into the recycling and have them made into something new? First of all, cans are free and there are a lot of them. It’s difficult to pass up free building materials. Secondly, let’s consider a scenario where we take said cans and recycle the aluminum into some other building material, nails or flashing or whatever. The big difference between using the can as-is and using the remade building material is energy used. Using the can requires no additional energy, but there is a huge energy usage when recycling aluminum. By using the can you save that energy cost. Not all recycled materials are purely functional. Glass bottles are used to create very decorative and amazing pieces of art. 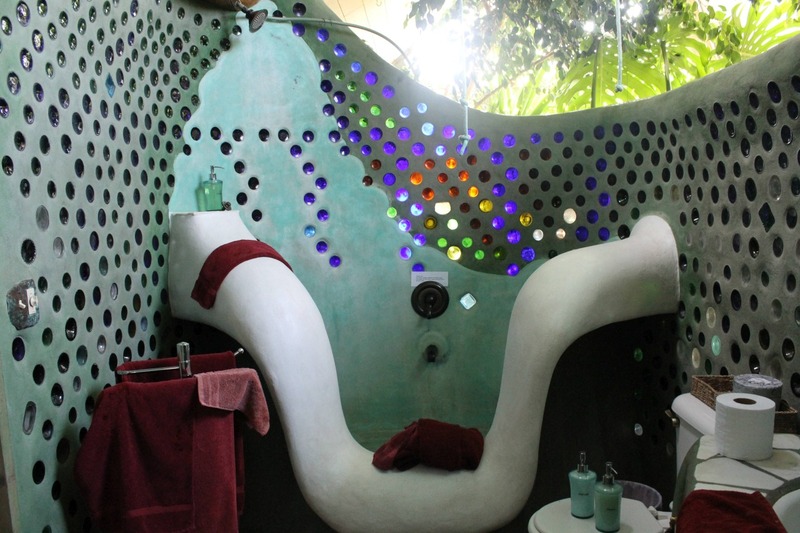 This is a bath tub in the Phoenix Earthship in the Greater World Community of Earthships down in Taos, NM. 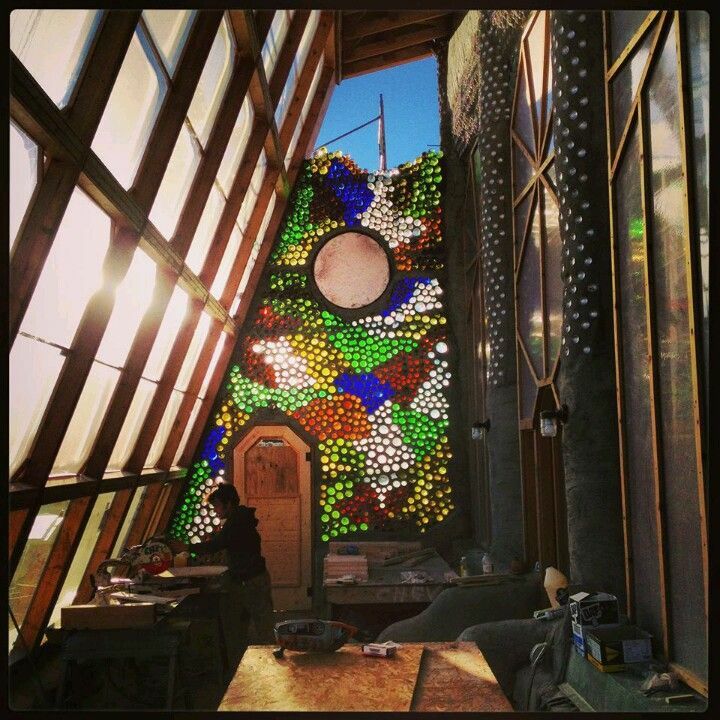 Here is a bottle wall under construction at the Towers, a two storey Earthship down in Taos. The glass bottles have their necks/tops cut off. You then find two bottoms that match and tape them together forming what we like to call a bottle brick. Similarly to the cans, these are placed in concrete. If you’re good, you plan it ahead of time, have the right colours and you can make some really awesome designs. Some other natural and recycled materials being used are straw and clay for making adobe, cardboard for putting in the bottom of the tires so the dirt doesn’t fall out the bottom when you start pounding it with the sledgehammer and old pallet wood that is repurposed into making kitchen cabinets. 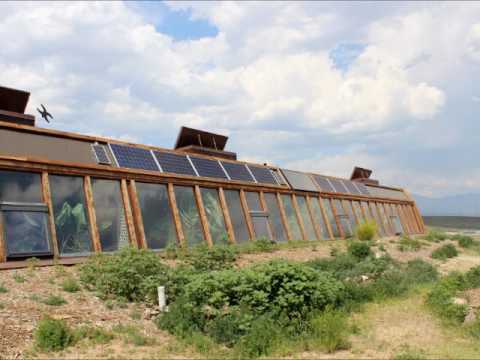 Earthships do use some conventional materials, like lumber, concrete, rebar and glass (windows) but the idea is to only use those things where necessary. What constitutes “necessary” will vary according to your design, location on the planet and what rules your municipality impose. You may be wondering why go to all that trouble of pounding dirt into tires and putting cans into concrete. The answers to that and other questions will be handled in the Thermal/Solar Heating & Cooling post. 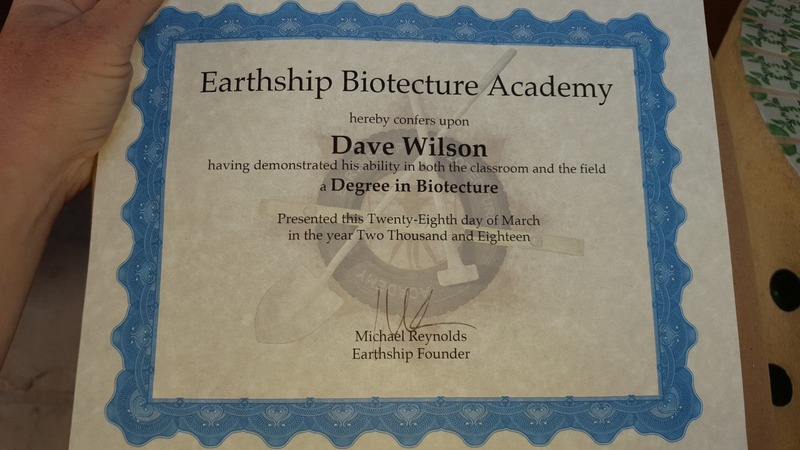 It’s official that I am now and official Earthship aficionado. I don’t quite have that piece of paper in my hands yet, but it’s in Kat’s hands so I figure that’s close enough. She will be receiving one of these herself at the end of the month. Then we’ll both be official. 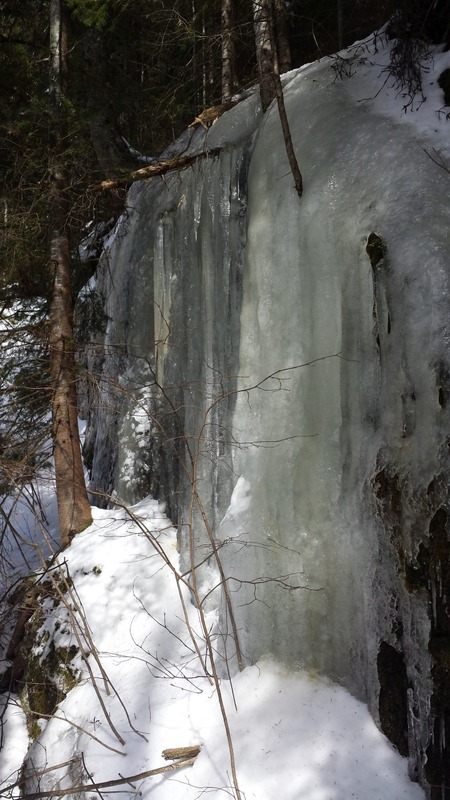 In other news, I found our very own ice wall on our property as I was wandering around it a while back. It’s not that tall, maybe 3m (10′) but it is a lot of fun to look at. If I were more adept at image manipulation I’d put some Lego persons doing the ice climbing thing on it. 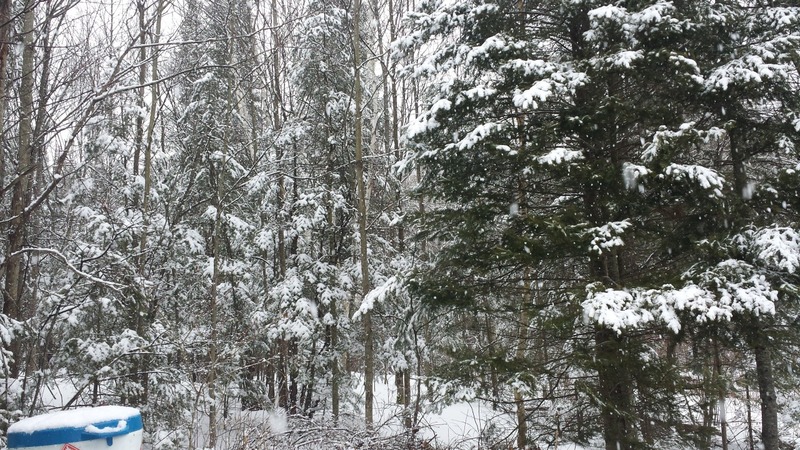 It’s April and that means highly erratic weather up here in this part of the world. Some days it’s nice and sunny and all of the snow is melting, then the next day you get this. Mix in some rain, ice rain and heavy wind with all of that and you never really know what the next day will bring from mother nature. It hasn’t been very cold, so I guess there are some good parts. As you may know I’m up here at the trailer taking care of things while Kat is away down south. While some might imagine this means wandering around in my underwear eating hot dogs and KD all the time, let me put those thoughts to rest. This is what I had for dinner tonight. 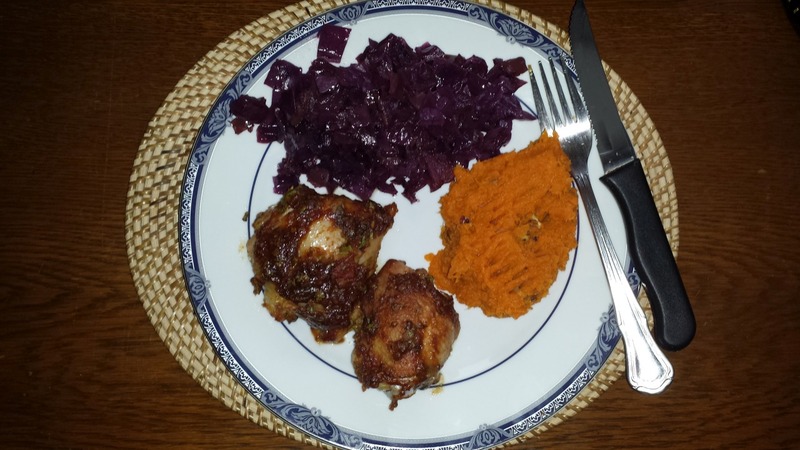 Those are baked chicken thighs in a peanut/salsa sauce with mashed sweet potatoes (with added pecans) and some sweet and sour purple cabbage. For those who know me, you know that I do most of the cooking when Kat is here, so eating well isn’t a problem. The only difference now is I have to do the dishes as well 😛 I’m sure I can handle this burden that has been placed upon me. Here we are having another warm day down here in the tropics. I think the lowest tempurature we have recorded is 24C (around 78F). The lowest humidity we have recorded is 53%. Obviously I’m from a colder climate and not used to these things, but I could comfortably run around with nothing on 24/7 here. Of course the locals and the tourists might get upset about that. Swimming and snorkling really helps to cool you off. I could happily do that every day, and most days I have. In our various walks around the island, we have found whole coconts washed up on shore. I opened one yesterday and found it had an interesting white seed looking think floating in the coconut water. I am no coconut expert so I can’t tell you what it was. 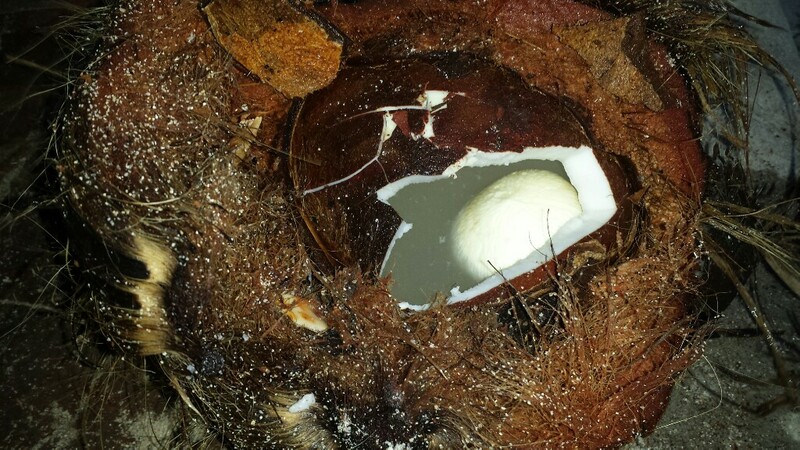 That was also the coconut that was in the best shape out of the three now that I have pried apart. A machete or other large knife would be really handy for that. 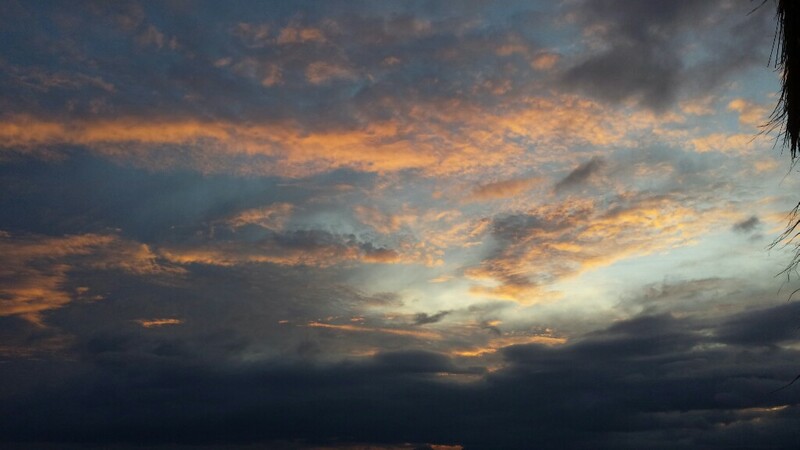 I got up this morning and the sun was just coming up, shining on the clouds, so I took a picture. That’s the fun thing about changing timezones across the world: you can adjust yourself to pretty much any schedule you want. 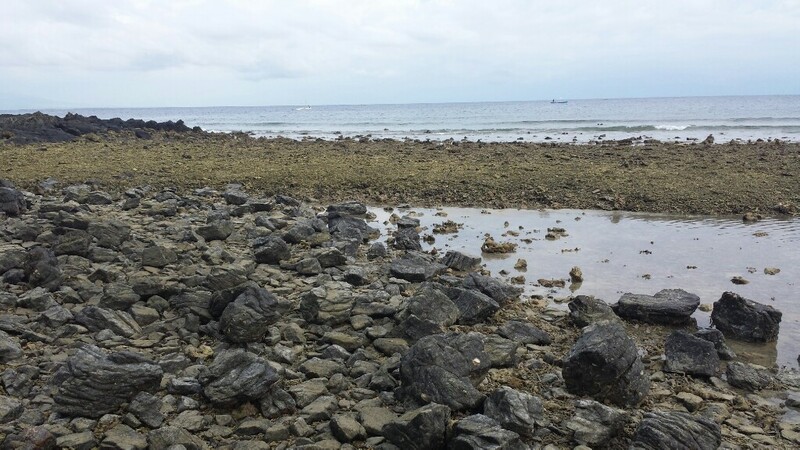 If you recall that picture of low tide I posted on the first day, well we haven’t had a tide as low as that since. 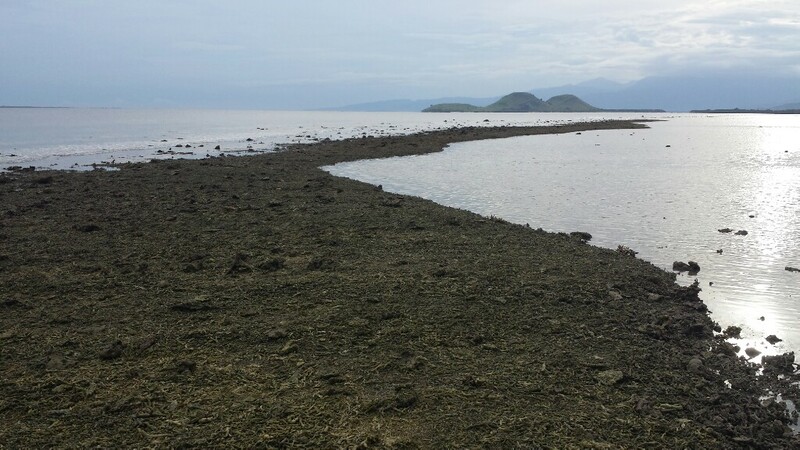 The low tide this morning was low enough that the long strip of dead coral was exposed out of the water so Kat and I took that opportunity to go check it out. 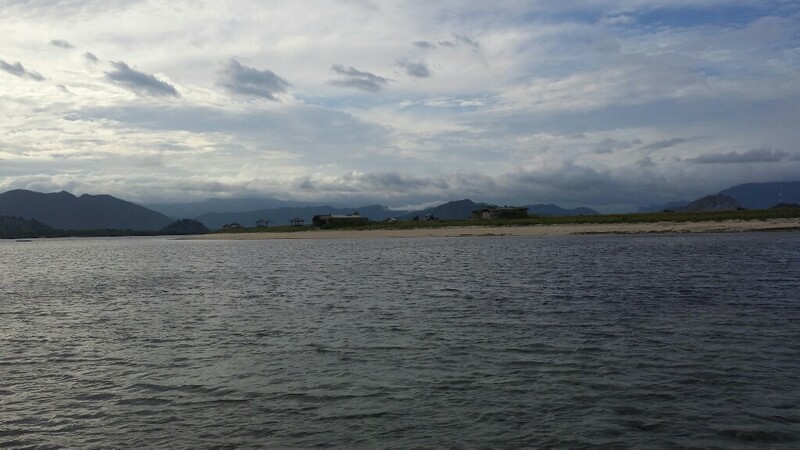 This first picture is where it connects with the shoreline, just down a bit from where we are staying. When you’re standing on it, this is what it looks like heading out to sea. We walked out to the end and then I took this picture of the two Earthships. You might think we were out in a boat for this picture, but I assure you we were standing on solid ground. Here is a picture I took looking back east towards the sun. 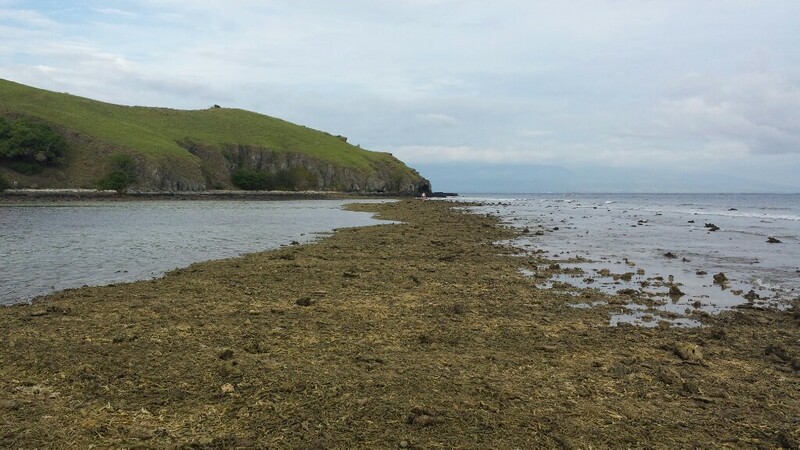 Looking back towards the direction we came, you can see Kat wandering towards me along the exposed coral. 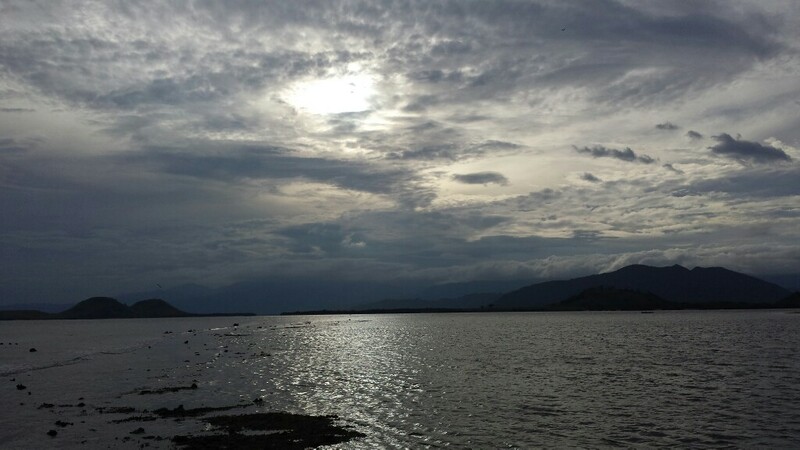 This last picture is looking out to sea. 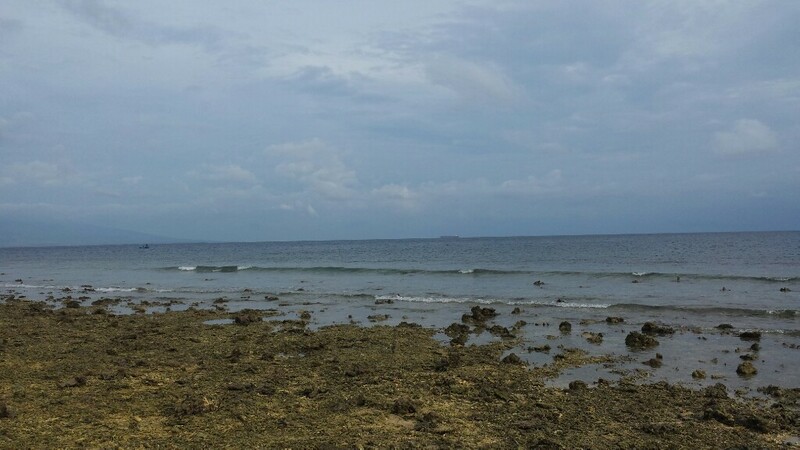 I even captured a big ship on the horizon. Fishing is a big thing here. There always seems to be some boats out in the water, especially at night. There are larger vessels further out that have very bright lights. We see them dotting the horizon when we go to bed. Things here are pretty quiet right now. We really need a drill to do some of the projects so we’re idling around waiting for that. We fill our time with walks, swims, meditation and anime. It’s not a bad life.